Thank you so much for your interest in volunteering with our organization! 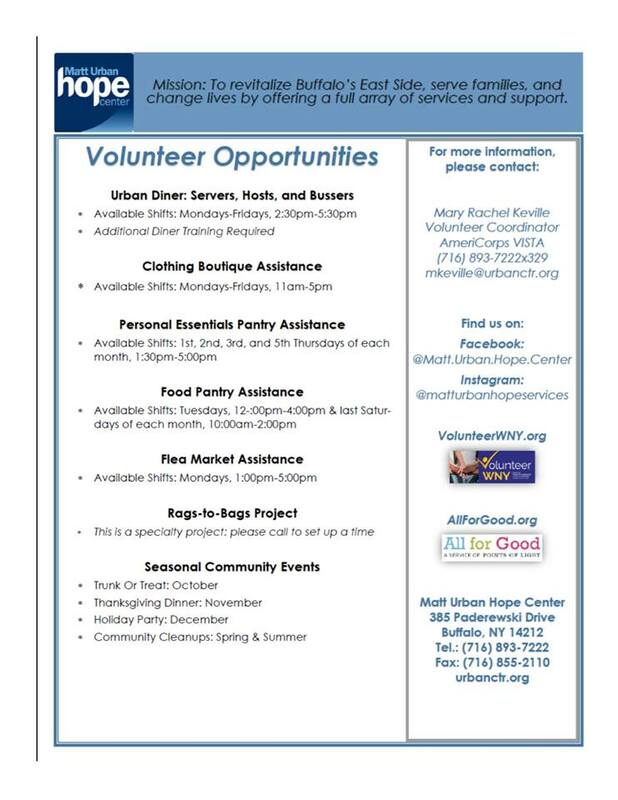 The Matt Urban Center has upcoming Volunteer Orientations which we encourage anyone new and interested in volunteering with our organization to attend. Our volunteer orientations will provide a more thorough overview of our organization, approach, services, upcoming events and volunteer opportunities through a presentation and tour of our center! Light refreshments will be served. Volunteer applications and confidentiality waivers will be provided and you will have an opportunity at the orientation to meet with Hope Center staff and potentially schedule/confirm a time to come in to volunteer. Please visit VolunteerWNY.org for upcoming orientation dates and to register or call (716) 893-7222 x329 to confirm your attendance. We host and plan a variety of community service events throughout the year, including clean-ups, repair projects, community art projects and more. check “I’m interested in volunteering” to get alerts when we are planning events or email directly for more information.